John’s was “a voice of one crying out in the desert,” the Gospel of Luke states (3:4), borrowing words of the ancient prophet Isaiah. Do those words, coupled with the Gospel of Matthew’s depiction of John eating “locusts and wild honey” and wearing camel’s hair garments (3:4), prompt some to imagine him as eccentric, strange and rather disheveled, shouting a message of repentance to anyone who would listen? But John “was famous,” Pope Francis observed in a 2018 talk in Peru. “All came to be baptized by him; they listened to him with respect.” The Gospel of Matthew affirms this (3:5). 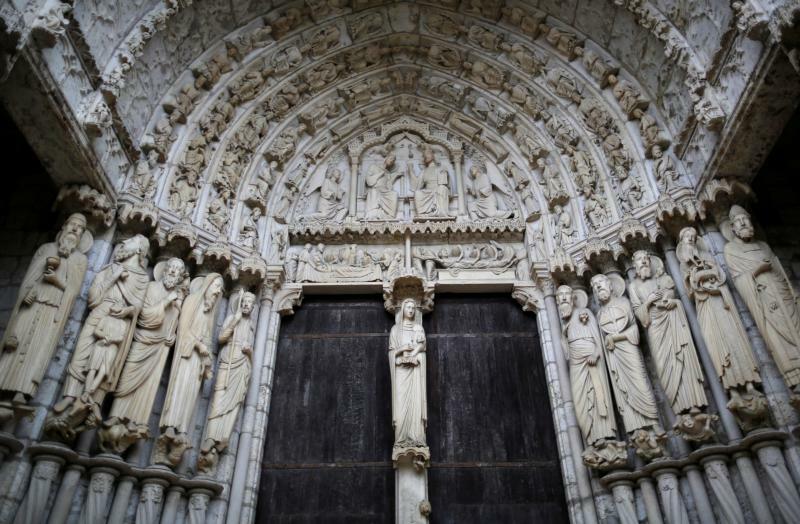 The unknown medieval artist who sculpted a figure of the Baptist for the magnificent cathedral in Chartres, France, seems to have wondered what he really looked like. The sculpture, standing above the cathedral’s north portico doorway, stunned me when I first saw it. If anything, this John the Baptist is a prayerful, appealing figure. The sculpture presents John as gentle, kind, self-possessed and even contemplative. He does wear a camel’s hair garment! It isn’t hard to imagine people asking his advice. Indeed, crowds coming to hear him in the desert did precisely that. What “should we do”? they asked (Lk 3:10). John responded, “Whoever has two cloaks should share with the person who has none. And whoever has food should do likewise” (Lk 3:11). So John the Baptist’s presence during Advent has a way of underscoring the importance of Christ’s second coming, one key theme of this liturgical season. Did our Chartres sculptor aim to jolt imaginations with an unpredictable, thought-provoking figure of John? “Works of art inspired by Scripture” can reflect “the unfathomable mystery which engulfs and inhabits the world,” St. John Paul II once said. During Advent, Christians remember that John the Baptist introduces Jesus as the Lamb of God. “Behold, the Lamb of God, ‘who takes away the sin of the world,'” he said when he saw Jesus coming toward him (Jn 1:29). Catholics will recognize these as the words priests proclaim at the time of Communion during the Mass. So John’s words echo even today in the church’s daily life. The lamb in salvation history is a figure of peace, mercy, kindness and freedom. By applying the blood of a lamb to their doorways, the ancient Israelites enslaved in Egypt were assured that God would protect them and free them for the journey to their homeland (Ex 12:3-13). Throughout Christian history, “Lamb of God” served as a descriptive title for Jesus. To know people well, it is essential not just to hear their words but to observe their actions. Don’t actions speak as loud, or louder, than words? The Chartres sculpture of John the Baptist clearly shows him in action. He is carrying the lamb of God, at once cradling him and pointing toward him. This is what all followers of Christ do. They become bearers of the lamb, carrying him into their world through their words and actions.